I believe that students learn through whole body experiences. 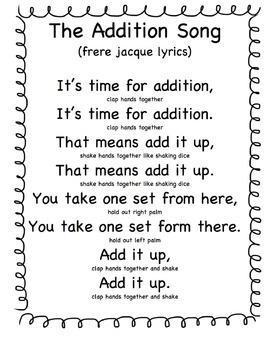 I have created a few math songs to help students with learning addition, subtraction and decomposing numbers. The songs are to a familiar tune. Each phrase has hand gestures. 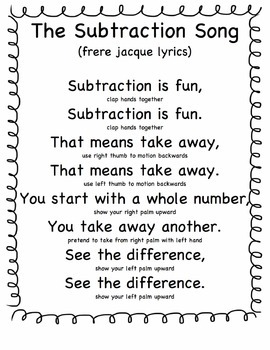 The addition and subtraction song are fun and easy to use. I have used them the last 2 years teaching Kindergarten. Both the parents and students love to sing them. 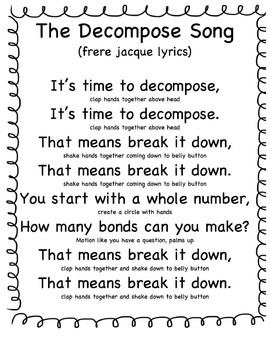 The decomposing songs are new this year. The same tune is used and similar hand gestures. To make it more interesting, you can add manipulatives or an anchor chart for visual aids.